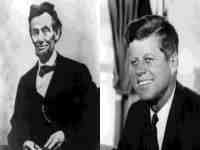 *** CHECK OUT THESE PRESIDENTIAL SIMILARITIES *** PURE COINCIDENCE?? YOU BE THE JUDGE! Booth ran from the theater and was caught in a warehouse. Oswald ran from a warehouse and was caught in a theater.